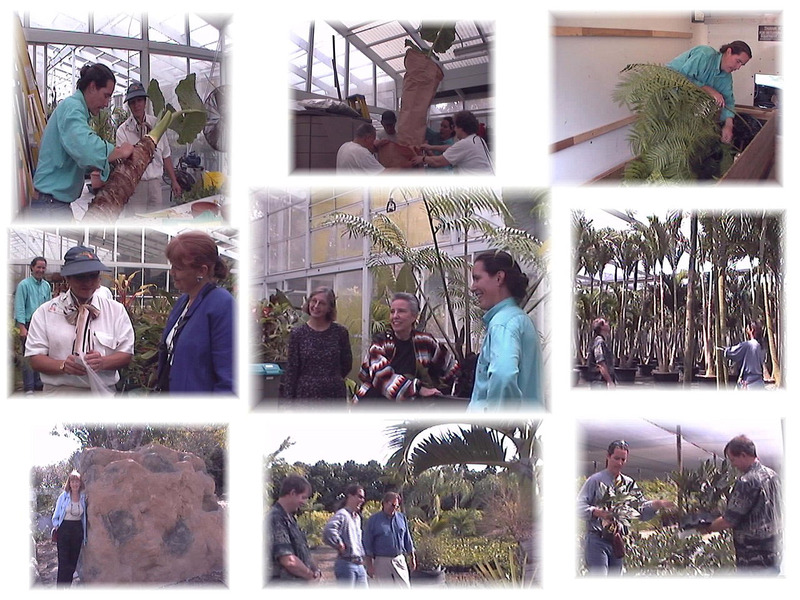 A Division of Tropical Services, Inc.
Top row: George Bailey, plant coordinator, prepares specimen for shipment as USDA plant inspector, Gwen Myers looks on. Volunteers assist with bagging large specimen. Bailey packs crate for first shipment. Center row: Inspector reviews international documentation with project coordinator Rose Haning. Garden director Dr. Julia Kornegy, Garden trustee and project benefactor Pat Herbert, and George Bailey look over first shipment. Display designer, Craig Allen and George Bailey select palms for display at Chelsea. Bottom row: Rose Haning inspects waterfall before shipment. Allen and Bailey discuss plant selection with a grower. Bailey and Allen select additional plants. Visit the Green Affairs Gallery for examples of our work. This site optimized for Netscape 4.0 or higher.